Where the hell is my ice axe? That was my first reaction when I saw the empty slot on my pack. It was two AM, we had just come running down the glacier, past a treacherous snowfield of boulders and ice ready to let loose, and we were preparing to make our way up the couloir towards Forbidden Peak and in the moonlight making the ice glisten, I berated myself. The fact that I had failed to latch it properly had now condemned our summit attempt to not happening, and now we had a 2,000-foot climb back up the glacier to look for it. It was an amateur mistake and a tough lesson, especially considering that up until that moment, we had moved fast and efficiently. As we searched for options so that the trip wouldn’t be a total loss, our guide turned to an icy tower that loomed over the Quien Sabe Glacier, a hulking monolithic 1,000-foot granite wall called Sharkfin Tower. It would turn out to be one of the best climbs I’d ever done. 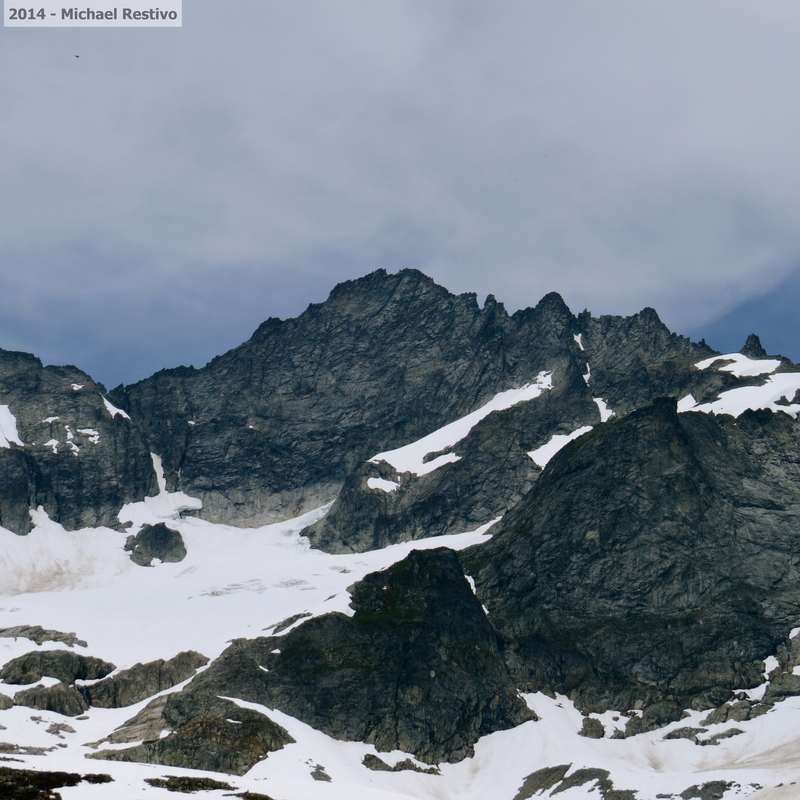 Set at the heart of North Cascades National Park, Boston Basin is an alpine paradise. Fortresses of rock rise up from three glaciers, while the peaks of Forbidden, Sahale, and Boston have serrated edges that cut through the sky. On the other end, smaller towers – fins of granite – form ridges and barriers that are formidable columns of stone in their own right. The area is so revered by climbers for its exposure, alpine ambiance, and remoteness, that the trail leading into the basin is unmaintained and wild, with branches that jut into the hiking path, hulking tree trunks from a 2002 avalanche, and four stream crossings, where water rushes from melting glaciers in the summer. Arriving in the basin is like stepping into a frozen world, sculpted by brown and gray towers and ridges that form a bowl around the glacier. The hulking Johannesburg Mountain looms menacingly over one edge, while Forbidden Peak’s iconic East and West ridges point up like edge of a knife, high above the snowfield. 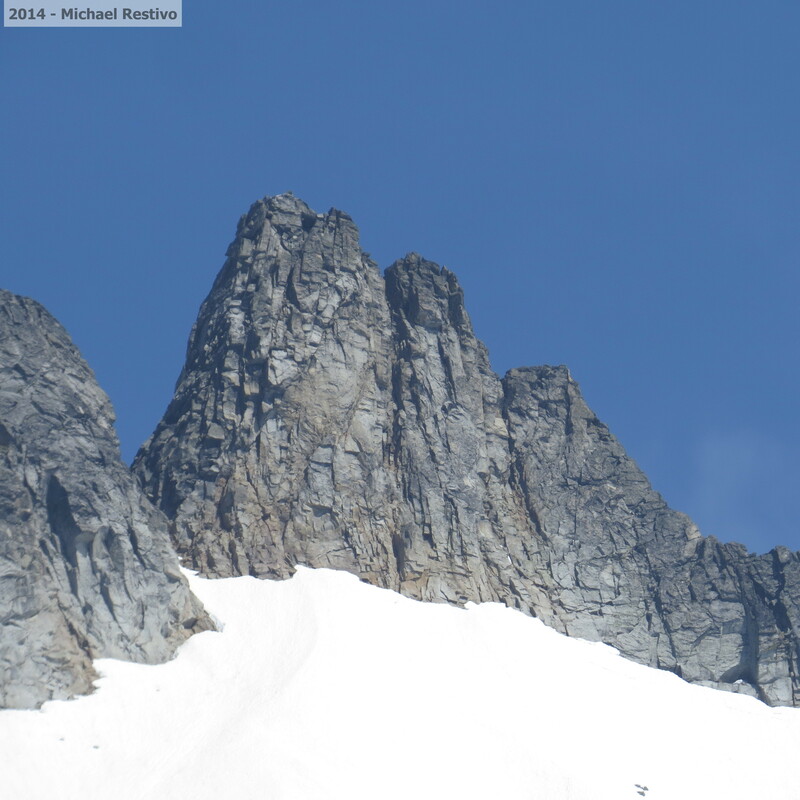 On the opposite end, Sahale Peak and her glacier rise are joined by Boston Peak and the rounded slope of Sharkfin Tower stands on its own, separating the Boston and Quien Sabe Glaciers. Any climb in the Boston Basin takes a fair amount of commitment. 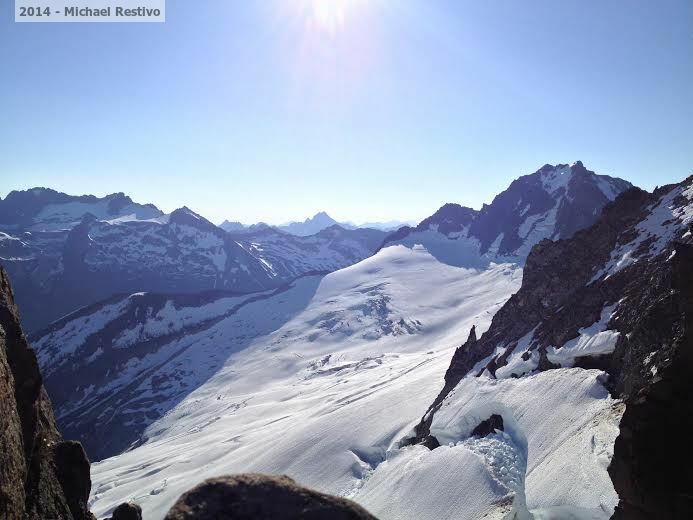 While the grades are of the moderate range (from 5.6 to 5.10) the climbing is tall and exposed, rising high from cracks and moats of the glaciers on thin ledges, cracks, and sketchy ridge traverses. 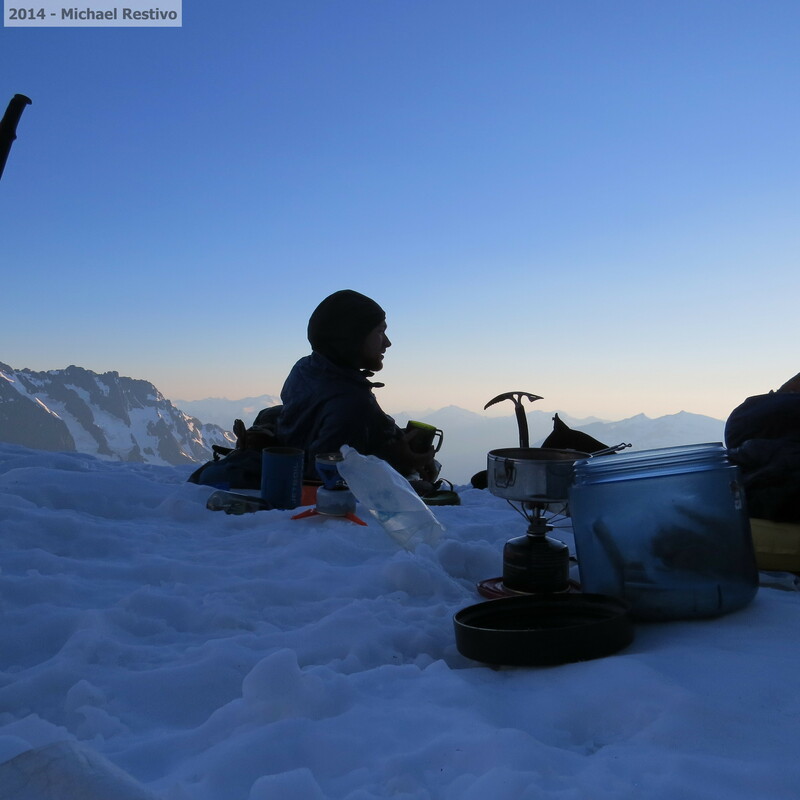 Our plan was to set a bivouac site (no tent, just tarps, sleeping bags and pads) high on the glacier, and descend in the morning to gain Forbidden’s famed West Ridge for a long climb to the summit. 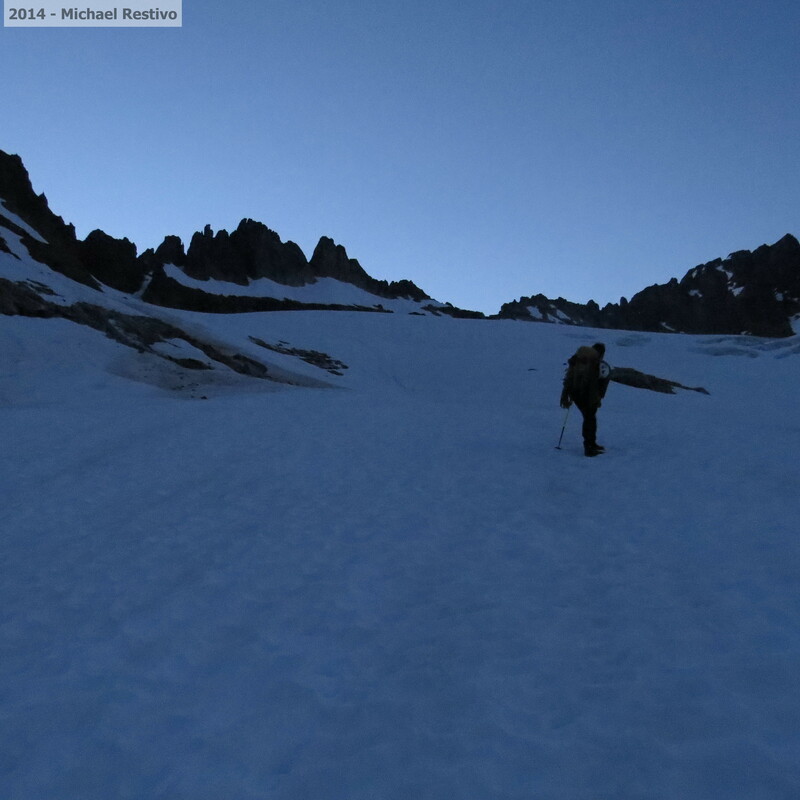 The ascent up the snowfield was a tough task on its own, requiring a calve burning slog through thick and soft snow, leaving us all exhausted as we laid out our sleeping gear, and prepared to tuck in for the night for the 1:30 AM start. As 1 AM rolled around, I brought my head out of the sleeping bag I had cocooned myself in, and took in a breathtaking nighttime vista that’s hard to forget. The full moon rose between Boston and Sahale peaks, illuminating a sea of ice that glistened in shades of white. Everything was shining so vividly that we I didn’t need a headlamp to see my movements. Two hours later, we once again crawled up the snowfield, searching for the lost ice axe, which we found three-quarters of the way between our bivvy site and Forbidden Peak. I wanted to scold the axe like a child, the cause of my troubles, but we prepared to make our way towards Sharkfin Tower. The climb to the shelf at the base left us breathless, calves burning, and we were already exhausted from the early start, but we made it to the wall and organized our gear. There are two options up to the bottom of the tower. The first is a narrow corridor of ice requiring technical ice tools, that which we did not have, or a 200-foot rock wall, separated by a snowfield. We easily scaled the bands and arrived at a staging point where the actual climb up the tower would begin. From the first pitch, the alpine ambiance makes itself known as the wall leans out onto a face rising over 1,000 feet above the Boston Glacier. A variation of face climbing and traversing across thin ledges ascends to a platform under the second pitch, a spectacular arete. 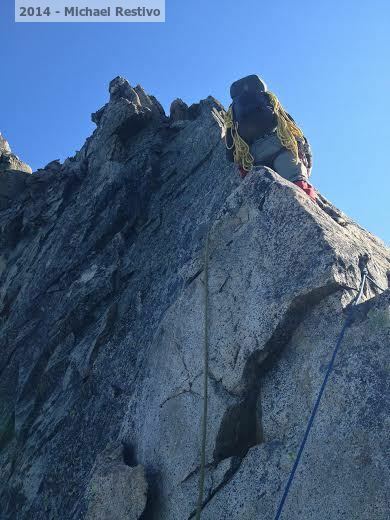 The thin granite bulge is mounted, weaving between the Quien Sabe face and the Boston face where at some moments, I was perched on my toes, staring into the blackness of crevasses and traversing across to a thin ledge across the knife ridge. The next pitch crosses the bridge between the towers, alternating exposure above the glacier and relative security between granite scaly shards that stick out of the ridge. One of the most imposing sights, is looking up at just how high the tower appears to grow. One more edge separates from the true summit, a mazy ascent which takes several gymnastic, technical moves, and some creativity in finding the next hold. I took deep breaths as I twisted my way up the tower, never wanting to look down, but knowing full well how high I really was. The last few moves to the top involved grabbing protruding thin edges, placing my boots on small holds, and lifting myself onto a three-foot wide platform that crowned the edge of the glacier. We were on the summit. Glacier Peak, one of the Cascade Volcanoes, dominated the vista in the distance, while we had a commanding view of the snowfield. Mountains soared into the distance, seemingly never-ending, while the slightly taller Forbidden Peak, majestically pinnacled next to us – the West, East, and imposing North Ridges completely visible. On the other side, the Boston Glacier is completely ice covered, with all of its peaks blanketed in thick snow. The difference from one side to the other is astounding. The descent from the summit is a bit tricky. 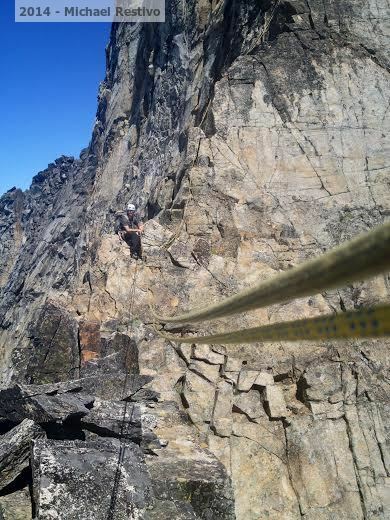 The descent involves down-climbing the ledges, crossing the knife edges in reverse, an assisted rope crossing on the bridge, and two rappels to the base, followed by a down-climb of the icy couloir. In total, the climb had taken us approximately four and half hours. I learned a lot about my abilities from this trip, but I also learned about things that I still need to work on. The good is that I’m now moving faster and more efficiently than I was on Hood, something that I’m taking with me when I go to Rainier in three weeks. I feel better trained, and stronger. What I need to improve on is making sure that I’m properly storing and latching my gear, and I need to work better on my stepping on ice and snow, trying to maintain better balance and stability. Overall, although we didn’t get to summit Forbidden, the trip was a massive success. I’m taking my rest day today to recover from the massive amounts of climbing we had to accomplish to reach our objectives, but in terms of the education I’ve received, I’m feeling much more confident about myself as a climber. Though I hate the cold I think pushing yourself outside of your comfort zone is important. Check out this guy’s climbing adventures. Hey great job Mike – it’s always a learning experience no matter what plans remain unchanged or change 🙂 Great to see you out tackling it all and self reflecting too! Hey Mike great job, really enjoyed reading this! Nice to hear you’re reflecting on your abilities – I reckon that happens whether plans remain or change – easy or hard climbs, new climbers or experienced ones. Part of the beauty to me. Good luck for Rainier!